The Federal High Court in Lagos on Friday refused to grant an application by the Economic and Financial Crimes Commission seeking to seize the funds in 15 bank accounts linked to former First Lady, Patience Jonathan. The funds, which the anti-graft agency sought to confiscate, included a total of $8,435,788.84 and over N7.35bn. Justice Mojisola Olatoregun in his verdict trashed the ex parte application filed by the EFCC for the seizure of the funds, saying the funds were already subject of litigation before two other judges. 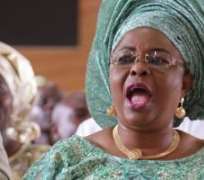 Waripamo-Owei Dudafa, then domestic aide to ex-President Goodluck Jonathan, had told the court that the $15.5m siezed from the former First Lady was her legitimate money. Dudafa said the multi-million dollars and other currencies belonging to Mrs Jonathan were cash gifts, inheritance and funds she holds in trust for others.